This is the 4th post in a series covering the results from an epic scope field test focused on long-range, tactical rifle scopes in the $1,500+ price range. This represents an unprecedented, data-driven approach to evaluating the best tactical rifle scopes money can buy. Hundreds of hours have gone into this research, and both the scope line-up and the tests I conducted are built on advice and feedback from some of the most respected experts in the industry. 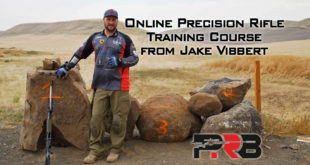 My goal with this project was to equip fellow long-range shooters with as much hard data as I could reasonably gather, so they could see what they’re paying for. Ergonomics Part 1 itemized a ton of measurable aspects of a scopes ergonomics. In this post, I’ll look at each scope one by one, and highlight the unique features in terms of ergonomics and overall usability for each. I’ll also include a photo gallery of each scope from just about every angle, and demo the scope from the shooter’s perspective. My goal is to itemize as many things as possible that you might notice if you had a chance to handle each scope yourself. I try to describe the feel of the turret as objectively as I can. Some of the things I mention may be very important to you, and other items you may not care about in the least … but I leave that up to you as the reader to interpret. Ultimately, ergonomics is all about personal preference. I’m just trying to pass on as much as I can through written content, photos, and video to help you understand what it feels like to use the scope. Most of this stuff isn’t published anywhere, so hopefully this helps you make a more informed buying decision. Relatively heavy for a 50mm scope. It weighs 2.2 pounds, which is about the same as large scopes like the Steiner 5-25×56 and the Leupold Mark 8. Very light clicks make it easy to adjust. The torque required to adjust elevation was one of the lightest tested (approximately 2.0 inch-pounds), but locking turret design reduces the downside of these light clicks. Light clicks like this make it easy to fine-tune your adjustment by 1 click without accidental overrun. Crisp clicks – The turret snaps cleanly into each adjustment. You might be able to accidentally stop in between clicks, but you’d probably have to be trying to do it. Can’t see what revolution you’re on when the turret is locked. Essentially the revolution indicator lines are hidden when you slide the turret into the locked position. This may not be a big deal to some, but if you regularly get into the 2nd or 3rd revolution often, you’ll learn to double-check often. Many shooters miss because they thought they were on a different revolution than what the scope really was set to. Typically, this happens when you engage long-range targets and adjust into the 2nd or 3rd revolution on the scope, and then forget to dial back down to zero before you start engaging your next targets. I’ve done it, and mental errors like that can be frustrating during a hunt or competition. In addition, the revolution indicators you see when its unlocked at the old-style lines, which aren’t near as obvious as more modern revolution indicators on some of the other scopes in this test. Slightly awkward turret lock – If you apply any downward pressure on the turret while dialing your elevation, it may accidentally slip into the locked position. This can be mildly annoying, but it may be something you could train yourself out of as you got used to the scope. You can see what I mean by this if you watch the demo video above. This happens a couple times about 40 seconds into the video. 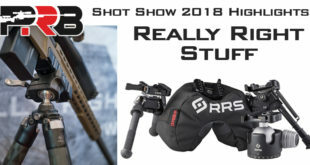 Only available with 5 mils per revolution – While that could be ideal for shooting out to 600-800 yards, it might be frustrating if you shoot beyond that because it’s harder time keeping track of what revolution you’re on. Bushnell offers a similar model (Bushnell Elite Tactical ERS 3.5-21x50mm), which features a turret with 10 mils per revolution. Lowest Click Density – With a relatively wide turret and only 5 mils per revolution, this scope had the lowest click density of any scope tested. That just means the hash marks aren’t cramped together, and it makes it easier differentiate between each one to ensure you’re on the right adjustment. That also means there is a considerable amount of travel between each click, which makes it easier to control than a short space. The hash marks are closer to the tube than on most scopes tested. That just means you may need to lift your head a little higher to see them. Heavy for a 50mm scope. 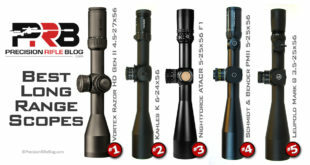 At 2.3 pounds, it weighed more than the Steiner Military 5-25×56 and Leupold Mark 8 3.5-25×56, and those are large scopes. Very consistent eye relief through entire magnification range. Very crisp clicks – Turret snaps cleanly into each adjustment. It’s impossible to accidentally stop between clicks. Can’t see what revolution you’re on when the turret is locked. See the notes on the Bushnell 3.5-21×50 above for more details. In addition, the revolution indicators you see when its unlocked at the old-style lines, which aren’t near as obvious as more modern revolution indicators on some of the other scopes in this test. Slightly awkward turret lock – If you apply any downward pressure on the turret while dialing your elevation, it may accidentally slip into the locked position. This can be mildly annoying, but it may be something you could train yourself out of as you got used to the scope. 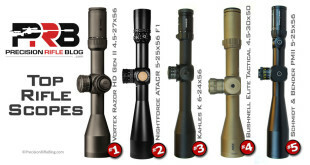 See the notes on the Bushnell 3.5-21×50 above for more details. 10 mils per revolution, instead of the 5 mils per revolution on the Bushnell Elite Tactical DMR 3.5-21×50. No distances marked on parallax knob. Some guys prefer this, but others like to preset the parallax to a general distance before they start a hunt or a stage of competition. For example, they may like it to be focused for roughly 300 yards. While indexes on the parallax knob are never perfect (exact adjustment can vary with temperature and other conditions), some find them helpful. Very heavy – Heaviest scope tested at 46.3 ounces. I’ve heard many shooters complain about the weight of the Schmidt and Bender 5-25×56, and this scope is 6.6 ounces heavier than it. Very wide turret was at least 12% larger than 75% of the scopes in this test. Many people feel like wide turrets give you more control and it helps the hash marks be a little more spread out and easier to differentiate. Widest scope at 4.3” – This is 0.4” wider than the next closest, which was the Valdada IOR scopes and even they felt pretty wide. It’s almost 3/4” wider than 75% of the scopes in this test. It just isn’t very compact, which could limit maneuverability. Very tall scope – The 2nd tallest scope, which measures 3.7” vertically from the bottom of the objective bell to the top of the turret. It just isn’t very compact, which could limit maneuverability. Relatively inflexible mounting length – Only has 1.6” of straight tube on objective side of the turret box, which limits how much you’d be able to move the scope within a mount to get proper eye relief for your natural point of aim. If a scope ring took up 1” of space on the tube, this would limit you to only being able to adjust the scope ±0.3” within the mount. You likely will need to adjust the mount on the rail to achieve proper eye relief. Uncommon tube diameter limits mount selection. The Hensoldt features a 36mm tube, which just isn’t as common as 30 or 35mm. Spuhr does make a great 36mm one-piece mount specifically for the Hensoldt scope. But this 36mm model doesn’t have a built-in bubble level, like most Spuhr mounts I’ve used. The built-in level is just one of several benefits of the Spuhr mount. They’re rock solid. Unusually large eye box makes it comfortable behind the scope. Although I couldn’t find a quantify this, a few testers commented that there was a noticeable difference with the Hensoldt when they looked through all 18 scopes side-by-side. The scope was simply more forgiving with slight head movement, and it didn’t result in scope shadow. Very easy to see what rotation you’re on – “Double Turn” (DT) turret design has a unique feature that forces you to lift the turret for the 2nd revolution. This makes it virtually impossible to get lost regarding what rotation you’re on. Play the demo video below to see what I’m talking about. Relatively heavy amount of torque required to adjust elevation (i.e. clicks are stiff). This was measured to be 4.1 inch-pounds for more clicks, and 7.5 inch-pounds for MTC clicks. MTC stands for More Tactical Clicks, and I can only describe them as more “sticky” on these clicks than others. The Hensoldt was more sticky on every whole number (0.0, 1.0, 2.0, etc. ), which just means it required almost twice as much force to adjust the scope from 0.0 to 0.1 than it did to adjust it from 0.1 to 0.2. The goal of MTC designs is that they provide more tactile feedback to the shooter so that they know where they are on the adjustment just by feel. That means they don’t have to lift their head from behind the scope or they could make adjustments in pitch black. Some guys like these, others hate them. I haven’t personally been in a scenario where I needed them, so I’m not a huge fan. One downside of MTC designs is that it is easy to accidentally overrun your target adjustment, because you have to apply so much pressure to “break out” of those whole numbers. If you need to adjust from 1.0 to 1.1, you will likely spin past it to 1.3 or 1.4 and then back off a few clicks to get to 1.1 (hopefully without landing back on 1.0 and repeating the whole process). Extremely high “click density” – This means the hash parks are really packed together and could be difficult to differentiate between them. That could make it more tedious to ensure you’re on the intended adjustment. The Hensoldt has 1.6 hash marks every millimeter around the turret, which is over 20% more dense than any other scope. Only available in clockwise turret, while most North American scopes are counter-clockwise. You could make the switch, but it may be hard to get used to shooting some scopes that are CW and others that are CCW. No distances marked on parallax knob. Some guys prefer to not have distances on the knob, because they’re virtually never perfect (exact adjustment can vary with temperature and other factors). But it’s sometimes helpful to preset the parallax to a ballpark distance before you start a hunt or a stage of competition. For example, a shooter may like to preset the scope to be focused for roughly 300 yards. So while exact indexes on the parallax knob are never perfect, having some numbers can be helpful (of course, you can also use a sharpie). Turret Overall Feel & Usability = Outstanding (5 out of 5 stars). Only 3 scopes were rated this highly of the 18 tested. Although the clicks were packed tightly together, I didn’t find that to be a problem. I’m also typically not a fan of MTC clicks, but these aren’t as hard to work with as other designs. Relatively lightweight –At just 32 ounces, the Kahles was the 2nd lightest of any 56mm scope in this test (only beat out by the Zeiss, and that was only by 0.3 ounces). 5th highest score for optical points per ounce, so there is a lot of performance for the weight you’d be carrying. Relatively short height at 3.1” makes it fairly compact and maneuverable. Wider turret than most scopes – Many people feel like wide turrets give you more control and it helps the hash marks be a little more spread out and easier to differentiate. Relatively short eye relief – I measured the average eye relief to be around 2.7”, where 3-4” is more common. Parallax adjustment (aka target focus) is around elevation knob – This is a unique design, but I didn’t see this being better or worse than a common side knob. It’s just as easy to use. See photos for more details. Fairly easy to see what rotation you’re on – Double Turn (DT) turret design only allows two revolutions, which makes it simpler to keep track of what rotation you’re on. A pin that pops up on the elevation turret when you’re on the 2nd revolution, and it’s flush when you’re on the 1st revolution. It isn’t as obvious as some other designs, but it is adequate. Easy to precisely adjust 1 click without accidental overrun. Amount of torque required to adjust the elevation was 4.2 inch-pounds, which is within the sweet spot many find ideal although towards the heavier end (2.5 may be too light without a lock, 5.0 may be too heavy). Hash marked are pretty packed – 2nd Highest “click density” of the 18 scopes tested, meaning the hash parks are pretty packed together and could be difficult to differentiate. The Kahles has 1.3 hash marks every millimeter around the turret, which is 30% more than most scopes tested. Turret Overall Feel & Usability = Good (4 out of 5 stars). The Leupold Mark 6 scope I tested had Leupold ZeroLock turret. It’s available with a few other turret options, but the ZeroLock turret design is what I’m referring to here. Very Short & Compact – Shortest scope tested at 11.9” overall. 2nd lowest height of any scope at 2.4” (measured vertically from the bottom of objective bell to top of turret). 2nd smallest width of any scope at 2.9” (measured from the outside edge of the windage turret cap to the outside edge of the parallax knob). Very Lightweight – 2nd lightest scope in this test, with at least 25% less weight than other scopes (besides the March Tactical 3-24×42 FFP). 2nd highest score for optical points per ounce, so it provides great performance for the weight you’d be carrying. Wide magnification ring makes it easy to adjust magnification. Length of area that rotates is 1.8”, where most scopes are 1” or less. This provides a bigger area to grip, so it may be easier to adjust without having to lift your head from behind the scope. Eye relief varies through magnification range – My tests showed a difference over 1” in the eye relief at the max magnification to the min magnification. Covered windage turret, but exposed elevation turret – Has a screw-on turret cap for the windage turret, but the elevation turret is exposed like every other tactical scope I tested. I actually like this design a lot, because most shooters hold for wind and only dial for elevation. Honestly, an exposed windage knob is more of a liability than a help for most shooters, because there is a chance you could accidentally move it off zero and you might not notice it because you don’t look at that adjustment near as often as the elevation. If you dial for wind, this could be inconvenient, but I applaud this feature. ZeroLock seems like ideal turret lock – I actually had a version of this scope with a Pinch & Turn turret, and another with a ZeroLock turret and I heavily favor the ZeroLock turret. Essentially, it provides the functionality to lock the turret at zero, but doesn’t make adjust awkward and tedious like some other locking turrets can. You can’t lock the turret at a particular elevation adjustment, just zero. But that is likely 90% of what the typical shooter wants. Relatively small numbers on the ZeroLock turret may be difficult to read from behind the scope. They were 20% smaller than the average scope tested. It also has relatively small hash marks, which could make it more difficult to ensure you’re on the correct adjustment. Not real easy to see what rotation you’re on – Design has a pin that pops up as soon as you move off zero, which means it is up for the entire 1st revolution, and then just pops up a little higher for the 2nd revolution. It may be difficult to tell the difference from the 1st and 2nd revolutions in stressful (i.e. either timed or high stakes) situations. Easy to adjust 1 click without accidental overrun. Amount of torque required to adjust the elevation was 3.2 inch-pounds, which is right in the sweet spot many find ideal (2.5 may be too light without a lock, 5.0 may be too heavy). The Leupold Mark 8 scope I tested had Leupold Pinch & Turn turret. It’s available with a few other turret options, but the Pinch and Turn turret design is what I’m referring to here. Largest objective bell of the 18 scopes tested. This was even bigger than the bell on the US Optics ER25 5-25×58, which has a 58mm objective. This likely wouldn’t be an issue, but just means it’s not quite as compact. Relatively inflexible mounting length – Only has 1.7” of straight tube on either side of the turret box, which limits how much you’d be able to move the scope within a mount to get proper eye relief for your natural point of aim. If a scope ring took up 1” of space on the tube, this would limit you to only being able to adjust the scope ± 1/3” within the mount. You will likely need to adjust the mount on the rail to achieve proper eye relief. Toolless zero reset is very convenient – You can reset the zero in 10 seconds without a single tool. You can even quickly switch out the ring with the numbers to a custom ballistic turret from Leupold’s Custom Shop. So you could have a ring that matches the ballistics for your 308 and another one for your 338 Lapua, and switch them out in 20 seconds. Very innovative feature. Auto-Lock Pinch & Turn turret can be cumbersome – This turret is also referred to as an Auto-Lock Push Button.Although some guys love it, I found the Pinch & Turn locking turret design to be somewhat awkward. You have to pinch the turret in two spots before you can adjust the elevation. This made hand placement critical, and you couldn’t make rapid elevation adjustments like you’re able to on most scopes. View the demo video below to see what I mean. How easy is it to see what rotation you’re on? Pending. Working with Leupold to ensure I understand how this is designed to work. MTC turret design – MTC stands for More Tactile Clicks, which just means the turret is designed to give feedback you can sense with touch to indicate when you’re at certain adjustments. It does that by making certain clicks slightly more “sticky” than others. Some scopes like Schmidt and Bender and Hensoldt do this on every whole number (0.0, 1.0, 2.0, etc. ), but the Leupold Mark 8 does this on multiples of 5 (0.0, 5.0, 10.0, etc.). MTC designs theoretically allow the shooter to sense where they are on the adjustment just by feel. That means they don’t have to lift their head from behind the scope or they could make adjustments in pitch black. Some guys like these, others hate them. I haven’t personally been in a scenario where I needed them, so I’m not a huge fan. One downside of MTC designs is that it is easy to accidentally overrun your target adjustment, because you have to apply so much pressure to “break out” of those “sticky” clicks. For example, if you need to adjust from 0.0 to 0.1, you may spin past it to 0.3 or 0.4 and then have to back off a few clicks to get to 0.1 (hopefully without landing back on 0.0 and repeating the whole process). However, because the Leupold scope only does this on multiples of 5, the downside is drastically reduced. I could see how this could be helpful, especially to require slightly more force to turn off zero. Clicks are NOT crisp – Unlike most other scopes, the clicks on the Leupold Mark 8 were a bit “mushy.” They didn’t snap into place with each adjustment, and you could easily stop between clicks on accident. While this may or may not have any impact on performance, it didn’t give you the confidence that positive clicks and tactile feedback provide. Relatively small hash marks could be more difficult to see. Turret Overall Feel & Usability = Poor (2 out of 5 stars). However, Leupold offers a few other options for turrets on the Leupold Mark 8, so you may be able to find a better option. I did like a lot of the features on the ZeroLock turret I tested on the Leupold Mark 6. Turret demo video for the Leupold Mark 8 is pending. I’m actively working with Leupold to ensure I understand how they intend for this turret to operate. I don’t want to publish misleading info, so I just want to double-check before I release the video. Very Lightweight – Lightest scope in this test, at 35% less weight than the average scope. The March scope also had the highest score for optical points per ounce, meaning it packed a ton of performance for its weight. Very short & compact – 2nd shortest scope tested at an overall length of 12.3”. Lowest height of any scope at 2.2” (measured vertically from the bottom of objective bell to top of turret). Smallest width of any scope at 2.8” (measured from the outside edge of the windage turret to the outside edge of the parallax knob). Turret dimensions and overall ergonomics of the physical design seemed to be ideal. Kind of easy to see what rotation you are on – Uses the old-style lines under the elevation cap like most scopes, which aren’t the most obvious indicators. But the March design does have a slight improvement, in that the lines are bold and stepped. But overall, this system isn’t near as apparent as more modern designs like those provided on tactical scopes from Steiner, Schmidt and Bender, Hensoldt, Kahles, and Leupold. Easy to adjust 1 click without accidental overrun. Amount of torque required to adjust the elevation was 3.4 inch-pounds, which is right in the sweet spot many find ideal (2.5 may be too light without a lock, 5.0 may be too heavy). I personally think the March scope had the perfect amount of torque out of the scopes I tested. Hash marks are closer to the tube than on most scopes tested. That just means you may need to lift your head a little higher to see them. Turret Overall Feel & Usability = Outstanding (5 out of 5 stars). Only 3 scopes were rated this highly of the 18 tested. The turret seemed almost ideal, with little room for improvement. Although I had no experience with March before this test, it has the best feel of any scope I’ve ever handled. Relatively heavy at 38.7 ounces, although 1/3 of the scopes tested were heavier. The Schmidt and Bender scopes were just 1 ounce heavier, and many people complain about their weight. Entire ocular bell rotates for magnification adjustment – This design makes it easy to grab the bell and quickly make magnificationadjustments from behind the scope, without having to lift your head. But it also means you can’t use common flip-up scope covers like those made by Butler Creek. That’s because when they’re open you’ll end up rotating the magnification and the cover will hit your rifle and break off. Ask me how I know! However, there are Tenebraex scope covers that work (which are outstanding and military grade), or you could use the new Butler Creek Tactical One Piece Flip Caps which are made of softer rubber instead of rigid plastic. Not easy to see what rotation you’re on – The revolution indicator on the ATACR is the old-style lines under the turret, similar to the Nightforce NXS. This isn’t the most obvious indicator, and it isn’t as near apparent as more modern designs like those provided on tactical scopes from Steiner, Schmidt and Bender, Hensoldt, Kahles, and Leupold. Easy to adjust 1 click without accidental overrun. Amount of torque required to adjust the elevation was 3.6 inch-pounds, which is right in the sweet spot many find ideal (2.5 may be too light without a lock, 5.0 may be too heavy). Fairly crisp clicks – The turret snaps cleanly into each adjustment. You might be able to accidentally stop in between clicks, but you’d probably have to be trying to do it. Turret Overall Feel & Usability = Average (3 out of 5 stars). Very heavy – 4th heaviest of all 18. Slightly heavier than the Schmidt and Bender scopes, and many complain about their weight. Elevation turret is extremely tall – Tallest scope at 3.9” (measured vertically from the bottom of the objective bell to the top of the turret). That is 1/2” taller than 75% of the scopes tested, and is a result of the very unique turret design on the Nightforce BEAST. It includes a turret locking mechanism on top and a switch to fine tune the adjustment ½ a click on bottom, and both elements add to the height of the turret. Relatively inflexible mounting length – Only has 1.5” of straight tube on objective side of the turret box, which limits how much you’d be able to move the scope within a mount to get proper eye relief for your natural point of aim. If a scope ring took up 1” of space on the tube, this would limit you to only being able to adjust the scope ±0.25” within the mount. You likely will need to adjust the mount on the rail to achieve proper eye relief. Entire ocular bell rotates for magnification adjustment – This design makes it easy to grab the bell and quickly make magnificationadjustments from behind the scope, without having to lift your head. But it also means you can’t use common flip-up scope covers like those made by Butler Creek … but that’s okay because the BEAST comes with Tenebraex scope covers in the box, which are outstanding, mil-spec scope covers that a lot of people highly recommend. MASSIVE Travel per Revolution – 1 revolution on the BEAST equates to 60 MOA or 20 mils, which is double what most scopes provide. That means you can shoot beyond a mile with a 338 Lapua and still be on the 1st revolution. However, a single click on the BEAST essentially equates to two clicks on every other scope tested, meaning the clicks aren’t as granular on the BEAST. The one I tested had 1/2 MOA clicks (most scopes are 1/4 MOA), and their mil/mrad turret has 0.2 mil clicks (most scopes are 0.1 mil). To give you back that granularity, they essentially added a fine-tune switch, which when you flip it will add 1/2 a click (either 1/4 MOA or 0.1 mils). So if you want 40.0 MOA of adjustment, you can quickly flip to 40 (still easily be on the 1st rotation) and engage. But if you want 40.25 MOA, you dial 40 and then flip the switch at the bottom of the elevation turret to add a 1/2 click. So there is a trade-off: you get a lot of travel on a single revolution, which means you likely won’t ever get lost on what revolution you’re on … but you now have one more thing to check (or accidentally overlook) before you engage a target. Honestly, there are mixed opinions on this design. Press & twist turret lock – With the new turret lock mechanism, you’ll be able to see red between the lock and the elevation turret when unlocked, and not that red when it’s locked. The overall idea of having to apply downward pressure and twist to lock the turret doesn’t seem convenient from behind the rifle, but it works. Easy to see what rotation you’re on – Double Turn (DT) turret design makes it hard to get lost (especially when it’s unlikely you’ll ever be on the 2nd rotation). Easy to adjust 1 click without accidental overrun. Amount of torque required to adjust the elevation was 3.0 inch-pounds, which is right in the sweet spot many find ideal (2.5 may be too light without a lock, 5.0 may be too heavy). Large numbers on turret are easy to read – These were the largest of any scope tested. Turret Overall Feel & Usability = Good (4 out of 5 stars). Would have been outstanding, but we may need a little more time behind the scope to get used to the idea of the 1/2 click switch. It seems like it could be one more thing you have to keep in mind when you’re behind the scope. Relatively lightweight – Excluding the small 42mm & 44mm scopes, this was the lightest in this test. The Nightforce NXS is a few ounces lighter than the other 50mm scopes in this test. It had the 4th highest score for optical points per ounce, so you get a lot of performance for the weight. Not easy to see what rotation you’re on – The revolution indicator is the old-style lines under the turret, which isn’t the most obvious system. 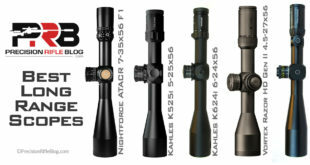 It isn’t as apparent as more modern designs like those provided on tactical scopes from Steiner, Schmidt and Bender, Hensoldt, Kahles, and Leupold. Note: I didn’t record a turret demo video for the Nightforce NXS, because it is virtually identical to the Nightforce ATACR. So if you’d like to see the experience behind the scope working the turret on the Nightforce NXS, just watch the video for the Nightforce ATACR. These are only half of the scopes I tested, and I’ll provide notes, photos and videos for the other scopes in my next post. Click here to view it now. I noticed that the Bushnell DMR windage turret only counts up if going right (1 mil left actually reads as 4). This is also the case with my Bushnell Elite 6500 and the Sightron S-TAC that I’m currently considering. What’s your take on this? Is that the only solution if a full turn is only 5 mils? Yeah, I hate that. It’s the primary reason you need high speed turrets not just for elevation, but windage too. But, I rarely dial for wind. I shoot in West Texas and it’s ALWAYS windy (2nd flattest place on Earth), but the winds are gusty … So they’re never the same shot to shot and you often have to adjust ad hoc in the moment. Having said that, there are times where it is best to dial for wind. For example, one time I was shooting a mover across a canyon with a 15mph crosswind (crazy OK guys set up the course). It moves both ways (left to right and right to left) and you get to shoot at it for one round trip. You really need to dial for wind in that situation, because you’re going to be holding for lead. It’s too confusing to have a windage offset and a lead offset. It’s possible, but not ideal. I say all that, to say even if you hold for wind most the time … I still don’t want a scope with only 5 mils of windage per revolution. It’s a bad design. But, those are price point buys … So they have to compromise somewhere. It’s just something to consider. Definitely a downside in my view. Pingback: March Scopes for a Scar 17?